All the basics for maintaining your pool, hot tub or spa to dazzling clarity. Contact your nearest Zagers Store with your specific questions. We’ve created thousands of sparkling spas and pools all over Michigan for over 50 years. Put our expertise to work for you! A list of tips, tricks and info to get you started with maintaining a home spa - get the most of your relaxation time! Contact Zagers for more advice from our spa experts. Watch this video to learn about an alternative to chlorine and bromine hot tub sanitizers. Water circulation is critical to ensuring even distribution of sanitizers, and also promotes filtration. As water circulates through the filter, it traps suspended particles. Run the spa’s circulation every day to ensure clean, clear, soft water. Because your spa filter traps many contaminants, cleaning it is very important. Many issues can occur when a filter is dirty or clogged. To clean the filter, first spray off loose debris with a garden hose with a high-pressure nozzle. Then, use a cleaner to remove small contaminants that can get embedded. Filters should be cleaned every 4-5 weeks. Regular cleaning preserves spa surfaces and prevents build-up. Use cleaning mitts and cleaner to remove the ring of oil and dirt that can build up at the waterline and eventually clog the filter. Over time, the water in your hot tub absorbs and dissolves minerals and chemicals. Based on how much you use your spa, when it starts to look dull, become foamy or develop an odor, it’s time to replace. Stop in to Zagers for a professional spa water testing to determine if it’s time to replace the water. The two primary components that affect spa water quality are pH and sanitizer (either chlorine or bromine). When both are within the right range, water is comfortable, protected and clear. Testing spa water ensures the proper chemistry! Simple test strips give you complete, easy test results that you can put into action. The 3 essential chemicals to maintain are sanitizers, oxidation and water balance. Watch this video from BioGuard for in-depth spa-care information. There is a lot to know about buying and maintaining a swimming pool to crystal clear perfection. Here is a list of tips, tricks and info to get you started. Contact Zagers pool pros with any other questions you have. Once the kids go back to school and Labor Day arrives it’s only natural to start thinking about closing your pool for the season. We recommend closing your pool when your water temperature is in the 60s, which typically means October in Michigan. That said, it’s always a good idea to plan ahead so that when it’s time to put your pool to bed, you have everything you need at your fingertips. If you’re not sure which accessories and products are needed to close your pool we have you covered. 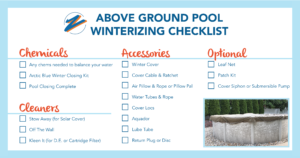 Here are easy to follow checklists for above ground and in-ground pools. Correctly winterizing and closing a pool in the fall is a critical to ensure that it will have clean, clear water in the spring. – Check for algae and brush down the walls, rails and other surfaces to remove it. – Skim debris from the water and empty the skimmer basket. – Test and balance the water; adjust chemicals accordingly. – Check and clean the filter. – Add a shock system to the water and let it circulate for 6 hours. – Shut down the equipment according to your owner’s manual, this may include draining part of the water. 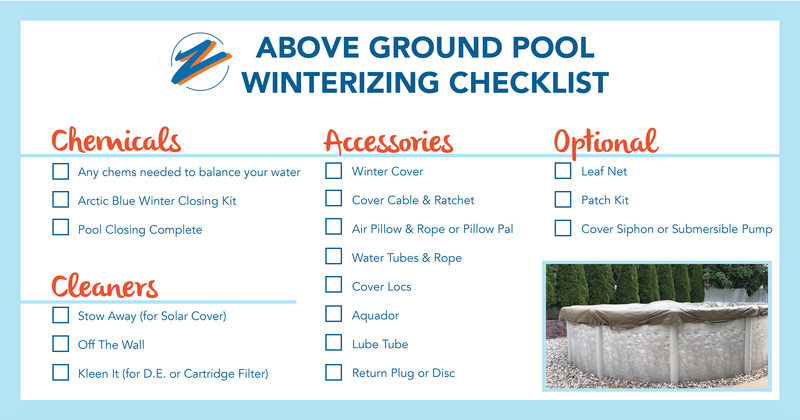 – Cover the pool with a winter cover to keep debris out. 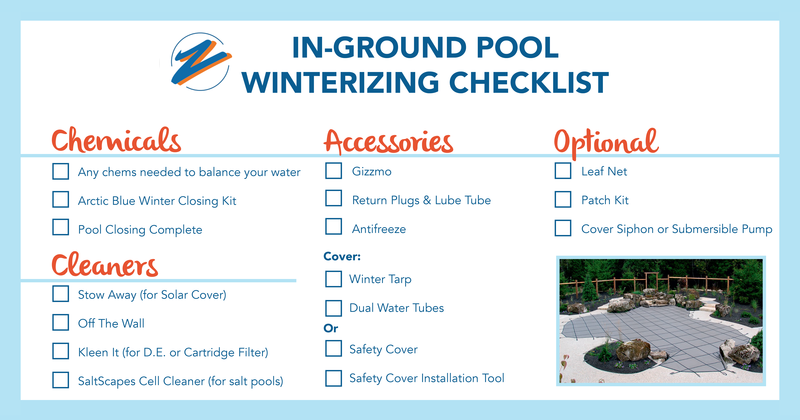 Watch this video on how to Close and Winterize your Above Ground Swimming Pool. While you’re enjoying a vacation outside your backyard, your pool could suffer! You don’t want to return to a dirty, green pool. 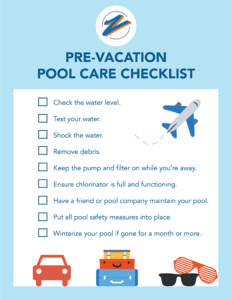 Check out our latest blog on pool care when going on vacation. Keep your pool sparkling clean with routine, daily maintenance. It will be the envy of the neighborhood! Pool water must be circulated properly in order to evenly distribute sanitizer chemicals. When water is in motion, it’s harder for the algae and bacteria to grow, keeping the water cleaner. It also helps the pool filter to capture debris. The best time to circulate the water is during the heat of the day. We recommend 8-10 hours daily. A good filter is a critical component of a dazzling pool. It removes visible and microscopic matter. Regularly backwash your filter to remove material trapped inside. In addition, a periodic chemical cleaning eliminates oils and embedded debris. Algae and bacteria grow more easily in the areas of the pool without as much circulation. It’s important to brush the walls and vacuum the floor to remove debris that’s not trapped by the filter. 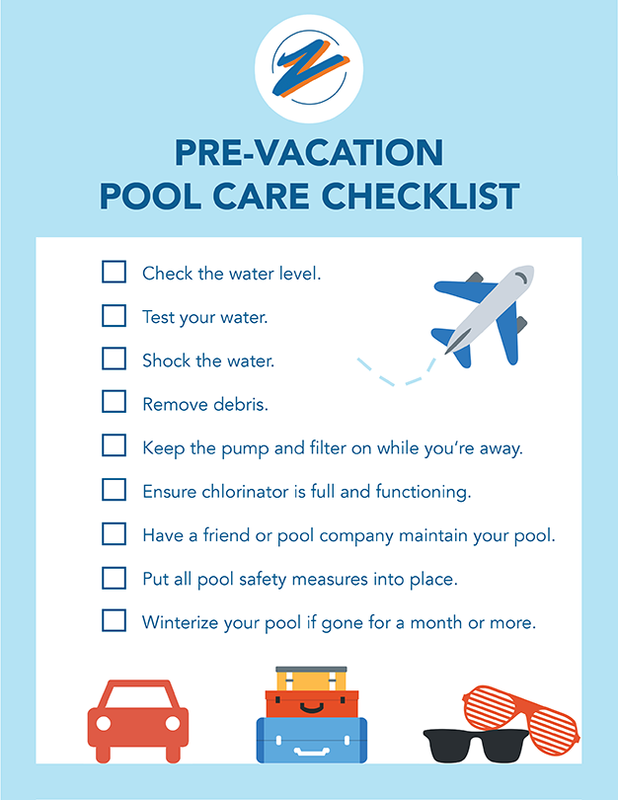 Test your pool water 2-3 times per week for pH and sanitizer levels. Because each swimming pool environment is unique, it’s important to test and adjust for your specific situation, and not just follow manufacturer guidelines. Periodically through the season, bring a sample of your pool water to any Zagers location for in-depth testing and personalized recommendations. Applying the right water treatment products, at the right time, will ensure brilliantly-sparkling results! It also provides a sanitary environment, balances the water to protect your pool. Watch this video from BioGuard® for additional, expert tips and tricks. When the weather starts to get warm, your pool is ready to be opened! – Remove the cover and lay it out flat to dry. Then, brush off the dirt and fold it. Store in a dry place, out of the sun. – Fill with water until it reaches the middle of the skimmer opening. – Check your pump, skimmer and filter to be sure they are working properly. – Remove debris from the water with a skimmer and vacuum. – Test and balance the water. Be sure to circulate the water for 24-48 hours before testing to ensure accuracy. Bring a sample of your pool water to any Zagers location – for in-depth testing and personalized recommendations. – Add chemicals as needed, including chlorine or sanitizer, and shock the water to remove contaminants. Add a preventative algaecide to keep algae away. – Run the pump for 24 hours upon opening, and then at least 8 hours a day after. Watch this video from BioGuard® on how to Open and Balance your Swimming Pool. Access to the Zagers blog which contains featured products, swimming pool tips, helpful information, and much more! Are you being rewarded? Sign up for our Z Perks loyalty program today and start earning points on every purchase. PLUS receive exclusive coupons just for our Z Perks members!